Multilingual software for Windows: Global Suite includes both Global Office and Global Writer for a reduced price. 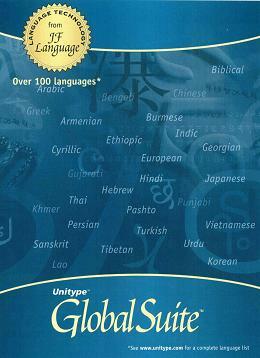 Both programs include support for over 100 languages. Use Global Office to type languages into Microsoft Office applications Word, Excel, PowerPoint and Outlook. Use Global Writer to create multilingual Unicode documents. Site license: specify the nuimber of installations you need.